Know a student program in need of extra funds this fall? Maybe a school needs money for a nutrition program or musical instruments, art classes or school garden supplies? 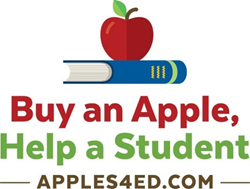 The U.S. Apple Association (USApple) – which represents the U.S. apple industry from apple growers to juice makers – wants to hear from you as it seeks nominations for the second annual Apples for Education: Buy an Apple, Help a Student cause program pledging school financial support one apple bite at a time. Through Sept. 19, educators, parents and people everywhere are encouraged to visit http://apples4ed.com/classroom-cause-entry-form/ to enter and share an important student cause in their community in need of financial support. USApple will then select finalists eligible for funds this fall. The school with the most tags – or votes – will receive the most funding, with additional funds awarded to other top-participating schools. Last year’s inaugural campaign received more than 20,000 votes and provided $21,000 to 12 student causes ranging from school gardens and playground makeovers to robotics and reading education initiatives—from small towns to large cities, coast to coast from Washington to Georgia. Brannen encourages people to submit nominations and get involved to help students in their local communities.